In January of 49 BC, Julius Caesar led his army across the Rubicon River in Northern Italy (see Caesar Crosses the Rubicon, 49 BC) and plunged the Roman Republic into civil war. Caesar's rival, Pompey, fled to Greece. Within three months Caesar controlled the entire Italian peninsula and in Spain had defeated the legions loyal to Pompey. region, Caesar established Cleopatra as his surrogate ruler of Egypt. Caesar defeated his remaining rivals in North Africa in 47 BC and returned to Rome with his authority firmly established. Caesar continued to consolidate his power and in February 44 BC, he declared himself dictator for life. This act, along with his continual effort to adorn himself with the trappings of power, turned many in the Senate against him. Sixty members of the Senate concluded that the only resolution to the problem was to assassinate Caesar. Nicolaus of Damascus wrote his account of the murder of Caesar a few years after the event. He was not actually present when the assassination occurred but had the opportunity to speak with those who were. He was a friend of Herod the Great and gathered his information during a visit to Rome. His account is thought to be reliable. "The conspirators never met openly, but they assembled a few at a time in each others' homes. There were many discussions and proposals, as might be expected, while they investigated how and where to execute their design. Some suggested that they should make the attempt as he was going along the Sacred Way, which was one of his favorite walks. Another idea was for it to be done at the elections during which he bad to cross a bridge to appoint the magistrates in the Campus Martius; they should draw lots for some to push him from the bridge and for others to run up and kill him. A third plan was to wait for a coming gladiatorial show. The advantage of that would be that, because of the show, no suspicion would be aroused if arms were seen prepared for the attempt. But the majority opinion favored killing him while he sat in the Senate, where he would be by himself since non-Senators would not be admitted, and where the many conspirators could hide their daggers beneath their togas. This plan won the day." "...his friends were alarmed at certain rumors and tried to stop him going to the Senate-house, as did his doctors, for he was suffering from one of his occasional dizzy spells. His wife, Calpurnia, especially, who was frightened by some visions in her dreams, clung to him and said that she would not let him go out that day. But Brutus, one of the conspirators who was then thought of as a firm friend, came up and said, 'What is this, Caesar? Are you a man to pay attention to a woman's dreams and the idle gossip of stupid men, and to insult the Senate by not going out, although it has honored you and has been specially summoned by you? But listen to me, cast aside the forebodings of all these people, and come. The Senate has been in session waiting for you since early this morning.' This swayed Caesar and he left." "Before he entered the chamber, the priests brought up the victims for him to make what was to be his last sacrifice. The omens were clearly unfavorable. After this unsuccessful sacrifice, the priests made repeated other ones, to see if anything more propitious might appear than what had already been revealed to them. In the end they said that they could not clearly see the divine intent, for there was some transparent, malignant spirit hidden in the victims. Caesar was annoyed and abandoned divination till sunset, though the priests continued all the more with their efforts. Those of the murderers present were delighted at all this, though Caesar's friends asked him to put off the meeting of the Senate for that day because of what the priests had said, and he agreed to do this. But some attendants came up, calling him and saying that the Senate was full. He glanced at his friends, but Brutus approached him again and said, 'Come, good sir, pay no attention to the babblings of these men, and do not postpone what Caesar and his mighty power has seen fit to arrange. Make your own courage your favorable omen.' He convinced Caesar with these words, took him by the right hand, and led him to the Senate which was quite near. Caesar followed in silence." "The Senate rose in respect for his position when they saw him entering. Those who were to have part in the plot stood near him. Right next to him went Tillius Cimber, whose brother had been exiled by Caesar. Under pretext of a humble request on behalf of this brother, Cimber approached and grasped the mantle of his toga, seeming to want to make a more positive move with his hands upon Caesar. Caesar wanted to get up and use his hands, but was prevented by Cimber and became exceedingly annoyed. That was the moment for the men to set to work. All quickly unsheathed their daggers and rushed at him. First Servilius Casca struck him with the point of the blade on the left shoulder a little above the collar-bone. He had been aiming for that, but in the excitement he missed. Caesar rose to defend himself, and in the uproar Casca shouted out in Greek to his brother. The latter heard him and drove his sword into the ribs. After a moment, Cassius made a slash at his face, and Decimus Brutus pierced him in the side. While Cassius Longinus was trying to give him another blow he missed and struck Marcus Brutus on the hand. Minucius also hit out at Caesar and hit Rubrius in the thigh. They were just like men doing battle against him. Under the mass of wounds, he fell at the foot of Pompey's statue. Everyone wanted to seem to have had some part in the murder, and there was not one of them who failed to strike his body as it lay there, until, wounded thirty-five times, he breathed his last. " Nicolaus of Damascus' account appears in Workman, B.K. They Saw it Happen in Classical Times (1964); Suetonius, The Twelve Caesars (Penguin Classics), translated by Robert Graves (1957). "The Assassination of Julius Caesar, 44 BC," EyeWitness to History, www.eyewitnesstohistory.com (2004). 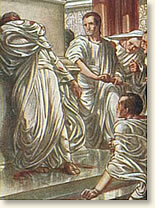 After the assassination, the senators fled, leaving Caesar's body on the Senate floor where it lay for a few hours before three slaves carried it to his wife.